The 1919 edition contained a "statement of registered motor vehicles, chauffeurs, and dealers from 1905 to 1919", and "a general summary of in the taxable property in Oregon from 1858 to 1918". Secretary of State Ben Olcott published the first edition in 1911 in response to an "increased demand for information of a general character concerning Oregon". In 1953, a legislative ways and means subcommittee, headed by Representative Francis Ziegler, was going to confer with Secretary of State Earl T. Newbry about how to improve the Blue Book. This was following complaints by Representative Monroe Sweetland that the book was "obsolete, carelessly edited, and only of limited use." Calling the book "an inferior job", Sweetland criticized the timing of book's publication long after elections, as well as the map in the back. As a result, the 1953 Legislative Assembly passed a law requiring the book be published soon after the legislature convenes. The 1993–94 edition of the book contained a four-page errata. When Norma Paulus was Secretary of State, she would send a free copy of the book to the first person to find a mistake in each new edition. The 1995–96 edition was reduced in size from its predecessors. A 1995 Register-Guard editorial called the book "indispensable". 1 2 "ORS 177.120". Oregon Legislative Counsel. Retrieved February 16, 2015. ↑ "About the Oregon Blue Book". Oregon Secretary of State. Retrieved February 16, 2015. ↑ United Press International (April 10, 1983). 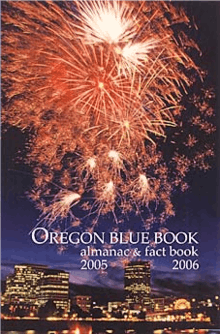 "New Oregon Blue Book Published". The Register-Guard. Retrieved February 16, 2015. 1 2 "Blue Book is Received Here". The Bulletin. September 11, 1919. Retrieved February 17, 2015. 1 2 3 4 5 "Blue Book Indispensable". The Register-Guard. May 25, 1995. Retrieved February 16, 2015. ↑ United Press International (September 21, 1937). "Oregon Blue Book Being Distributed". The Register-Guard. Retrieved February 17, 2015. ↑ United Press International (April 27, 1981). "Oregon Blue Book Makes Biennial Appearance". The Bulletin. Retrieved February 17, 2015. 1 2 3 United Press International (March 23, 1953). "Legislative Group to Study Revision of 'Blue Book'". The Register-Guard. Retrieved February 16, 2015. ↑ Associated Press (January 25, 1955). "Oregon Blue Book Printed But It Isn't Blue Any More". The Register-Guard. Retrieved February 17, 2015.